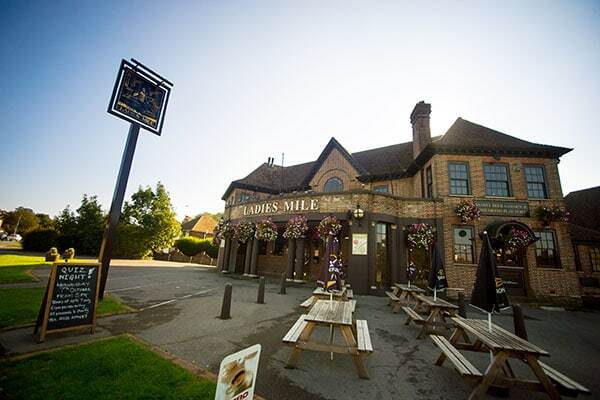 Ladies Mile Pub, or The Mile to the locals, is a cavernous, portico-fronted, family-run, traditional local pub located in the heart of old Patcham village. It is popular, family and dog-friendly and prides itself on being a real hub of the community. Inside, there is enough space for several distinct areas. There is a long bar, with gas fires at either end, and large televisions for sports fans. Above the bar there is an extraordinary, back-lit, stained glass ceiling and all the doors in the pub feature lovely art deco detailing. To the left of the bar, there is a games room with a dart board and, be still my heart, a proper, bona fide, English pool table, which, once a British pub staple, now tragically seem to be a real rarity. At the other end of the bar, around the corner, is a good-sized dining room. This is the home of Tisbury’s Kitchen. 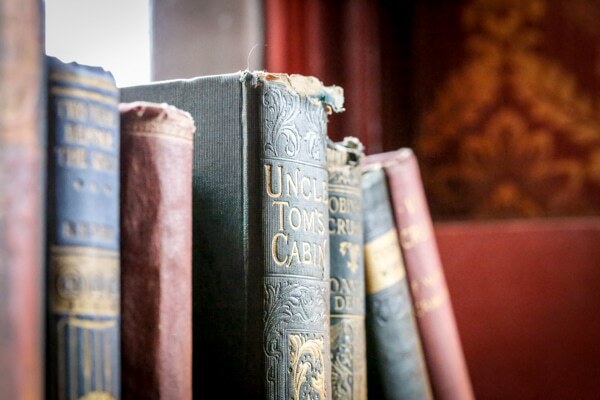 There are wood floors, classic wood furniture, faux bookshelf wallpaper, a striking, deep green, textured celling hung with chandeliers sporting quaint little lampshades. We settled in and had a look at the menu. I ordered a glass of Pinot Grigio and Andrew had a glass of house red, both of which were very pleasant. Chef Russell Tisbury had recently added a few new dishes to the menu so we decided to give them a go. 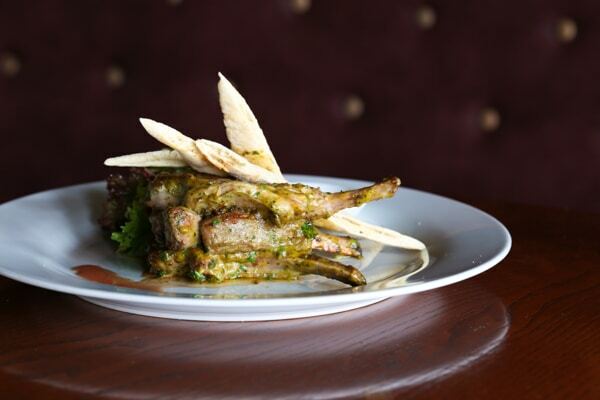 For his starter, Andrew had the lamb chop “lollipops”, lamb cutlets, pan-seared with satay sauce, dressed salad, flat bread and sweet chilli. He got three delicious, nicely trimmed lamb chops, which were succulent with lust a hint of pink in the middle. They were well-seasoned and coated in a rich, savoury, nutty satay sauce. They came with a small fresh salad of lightly dressed lettuce, red cabbage, red onion, grated carrot and cucumber, and large, decorative shards of crisp, toasted white pitta bread with a little dish of sweet, spicy, chilli dipping sauce on the side. Andrew really enjoyed it. I had the mozzarella fritti, panko-crumbed mozzarella, crisp fried and served with tomato sauce, pesto and a rocket and parmesan salad. It was naughty but extremely nice. I got a whole ball (!) of fantastic, oozing, stringy mozzarella, coated in a golden, crispy crumb with a rich, thick, tangy tomato sauce and a tasty, vibrant green, basil-rich pesto. I also got a handful of fresh rocket leaves dressed with an artistic drizzle of balsamic reduction and topped with generous shavings of crumbly, salty parmesan. It was like all the best bits of a pizza, distilled into a seriously decadent, easy to handle, plateful of yummy comfort. 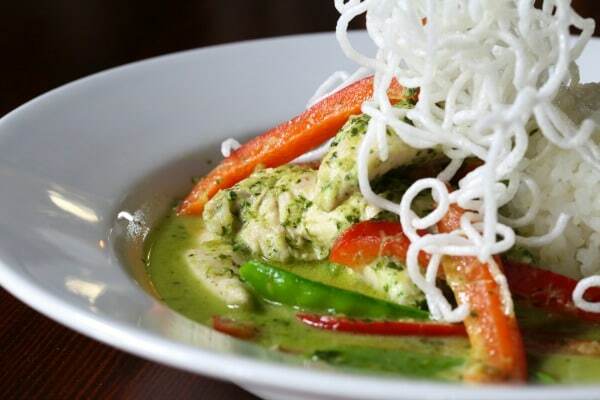 For his main, Andrew had the green Thai chicken curry (you can also opt for prawns), poached chicken and vegetables in a coconut cream sauce with sticky rice and crispy noodles. Thai green curry is a particular favourite of Andrew’s so it was a no-brainer. The chicken was nice and tender and the vegetables, a mix of peppers and mangetout, were good and crunchy. The homemade curry was rich and creamy, a healthy green from plenty of coriander and salty with fish sauce and brown shrimp paste. It came with a mound of sticky rice and was topped with a nest of white, crispy, deep-fried rice noodles. 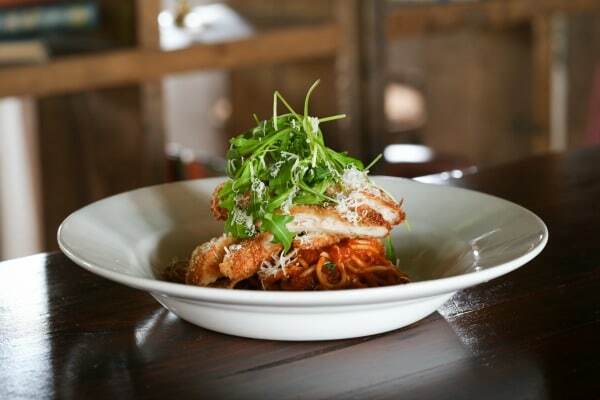 I chose the chicken Milanese, crispy breaded chicken breast, served on spaghetti Pomodoro with a rocket and parmesan salad, a childhood favourite of mine that evokes happy memories of holidays in France when I was too young to deal with frog’s legs and snails (at forty something I’m still too young to deal with snails!). I got a substantial mound of spaghetti, thickly coated in rich tomato sauce topped with slices of bread-crumbed chicken. Unfortunately, the coating had absorbed some of the sauce and lost its crunch but it was still well-seasoned and tasty. The plate was finished with a handful of fresh rocket leaves and a good grating of parmesan cheese. It was a deceptively generous portion of simple, wholesome, filling food. Finally, as it was Shrove Tuesday, the chef was treating his customers to crepes for dessert. Happy days given that it’s been many years since we both remembered, and were actually organised enough, to make pancakes on pancake day, so we were properly chuffed! We were already quite stuffed so opted to share one between us. We got a large soft pancake stuffed with vivid red, sweet, tangy, hot, juicy, stewed fruit, including strawberries, blackberries and blackcurrants, topped with a scoop of vanilla ice cream and a light dusting of icing sugar. We fought over the last mouthful! So, in summary this is reasonably priced, no frills, unpretentious, tasty and filling, comfort food. The service was very friendly, and the food was delivered at a nice, relaxed pace.